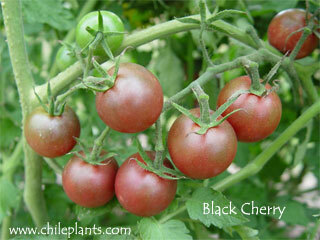 All photos Copyright © Cross Country Nurseries BLACK CHERRY - Small Round Cherry; matures deep brown; Cherry Leaf; Mid Season (70-80 days); heirloom; first black cherry! ; Uses: Prolific; Indeterminate; S.lycopersicum. 20 seeds.